Located on Kenilwood Dr between Sidco Dr and Armory Dr, Extra Space Storage serves Nashville residents near South Nashville, Berry Hill, Oak Hill, Green Hills, 12 South, and more. 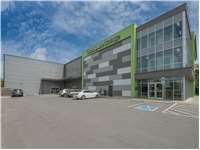 Locals will recognize our facility next to Picture Frame Warehouse a few minutes south of One Hundred Oaks Mall. Are you a college student looking for secure storage close to campus? Extra Space Storage is about 4.9 miles from Belmont University, making us a convenient option for summer storage. With a wide range of storage units, climate-controlled storage, and exceptional security, Extra Space Storage on Kenilwood Dr has what you want in a Nashville storage facility! We can accommodate both residential and commercial storage needs! Our Kenilwood Dr storage facility has unit sizes from 5x5 to 10x35 with convenient features like first-floor access and elevator access. At Extra Space Storage, we're committed to the security of your items. That's why our Nashville location is backed by security features like electronic gate access, 24-hour video surveillance, and security access to your floor only. With climate-controlled units, you can store your temperature-sensitive items with confidence! Climate control ensures your unit stays comfortably between 55 and 80 degrees no matter the season. Extra Space Storage strives to provide reliable self storage with excellent customer service. From our secure, clean, well-maintained facility to our friendly, professional team, we go the extra mile to ensure you have a great storage experience with us. Contact us today to reserve a storage unit in Nashville! It was easy to reserve the storage unit. The web site is friendly to navigate and pricing competitive. Storage Manager followed up with phone call to discuss our needs. Facility is new and very clean. Manager is professional and helpful. Excellent brand new climate controlled facility! Friendly customer service, Roy the manager is very helpful and professional. Great pricing and convenient location near I-65. My overall experience has been great. I would never use another storage company but them they are on point help at any time with any thing you need. They are clean protected and never miss a beat. Please use this company. This is a great storage facility with competitive prices and awesome customer service. Roy at the Kenilwood location was extremely helpful to me as this is my first time using a storage unit. I would recommend Extra Space to anyone looking for storage options. The facility is clean, well maintained, and has ample security features from keypad door access to well-lit parking and hallways. The rental process was easy and has taken some of the stress out of our moving process. Drive south on I-65 S. Take Exit 79. Continue onto Armory Dr. Turn right onto Sidco Dr. Turn right onto Kenilwood Dr. Our facility will be on your right. Drive north on I-65 N. Take Exit 78. Continue onto Sidco Dr. Turn left onto Kenilwood Dr. Our facility will be on your right. Drive west on Harding Pl. Turn right onto Sidco Dr. Turn left onto Kenilwood Dr. Our facility will be on your right. Drive east on Battery Ln. Continue onto Harding PL. Turn left onto Sidco Dr. Turn left onto Kenilwood Dr. Our facility will be on your right.